Please accept my apologies that it is over a month since the last bird of the week. I seem to have been distracted by Christmas, New Year, etc. Anyway, here is a spontaneous one. I’m in the public library in Ingham at the moment getting my car serviced. I was planning to work on the book Where to Find Birds in Northeast Queensland, but had a nagging feeling that I should really do the bird of the week. 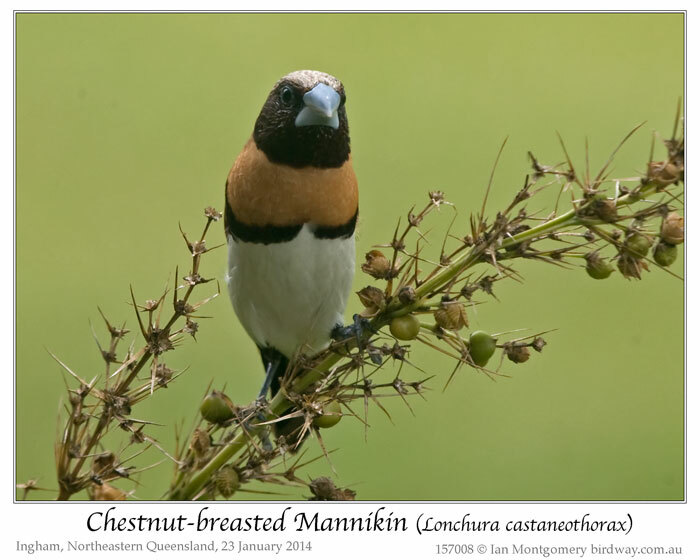 I found a table at the back of the library with a pleasant view over the adjacent Tyto Wetlands and spotted 3 Chestnut-breasted Mannikins feeding on the ornamental grass seeds just outside the window. I had my camera with me and got a couple of photos of one before they noticed me (second photo) and flew away. The photos are a bit cloudy having been taken through glass, but it was good quality plate glass. 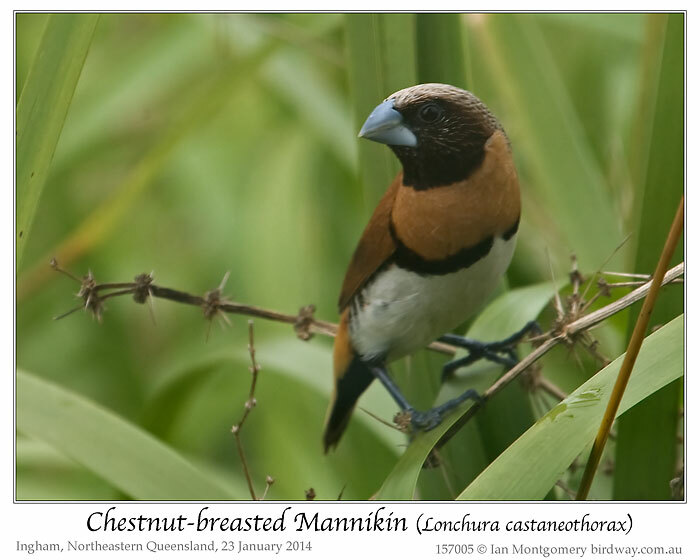 Members of the genus Lonchura are usually called Mannikins in Australia but they also occur in Asia where the name Munia is used. This incidentally, is the view of Tyto Wetlands from the library. The dark speck on the lawn in the foreground on the left hand side is the bird in the first two photos. 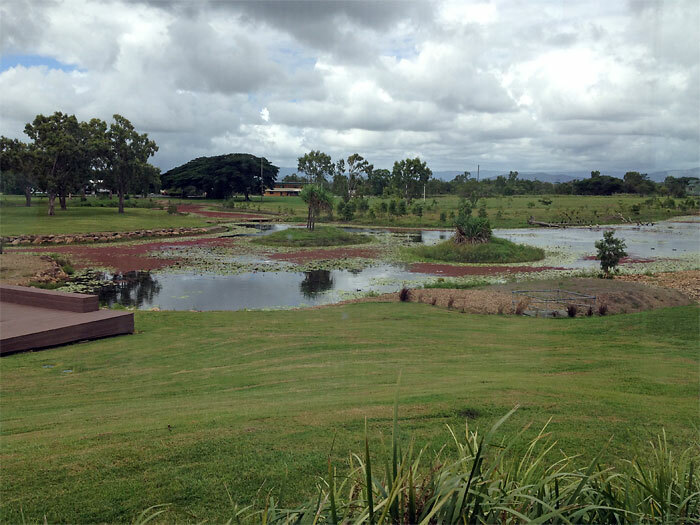 Tyto Wetlands gets its name from the Barn Owl genus Tyto as it is a known haunt of the elusive Eastern Grass Owl Tyto longimembris which nest sometimes in the grassy area between the wetlands and the local airstrip. I have seen them here on a number of occasions and they have been reported here quite recently, but no photos unfortunately yet. Ingham is quite a small sugar-cane town so it is greatly to their credit that they, under the guidance and encouragement of John Young of recent Night Parrot fame, have created this wonderful wetland and sanctuary. There is also a large wetland centre near the highway, well worth a visit if you are passing this way. Now back to the book. I finished the bird section and am now taking photos of as many as possible of the locations and that quest has taken me to some interesting spots that I’ve never visited before. Sounds like you were as busy as the rest of us. What a beautiful bird. I love the clean lines where the colors change. Another neat creation. Munia and Mannikins belong to two different families. 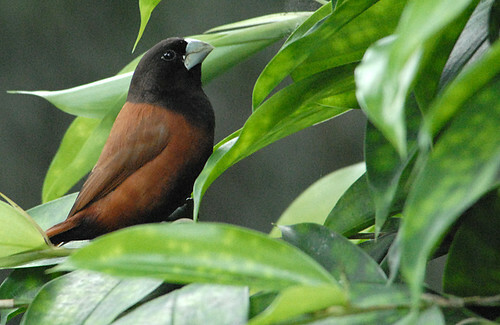 This Chestnut-breasted Mannikin is actually one of the 151 species in the Estrildidae – Waxbills, Munias & Allies Family. There is a family with Manakins that can confuse someone because of the close spelling. (Mannikin vs Manakin) The Pipridae – Manakins Family has 52 species in their family. 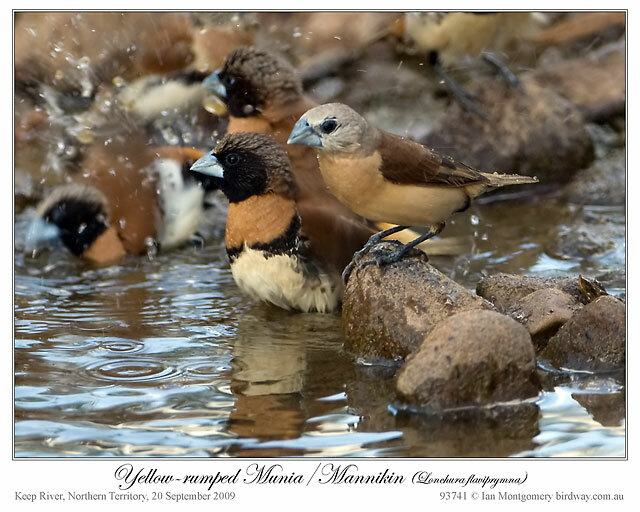 Although last week’s bird, the Gouldian Finch, was a welcome encounter in Wyndham my main target in the Kununurra district of NE Western Australia was another finch, the Yellow-rumped Munia or Mannikin (members of the genus Lonchura are usually called Mannikins in Australia and Munias overseas). This species has a very restricted distribution, occurring only in the eastern Kimberley and in northwestern Northern Territory. 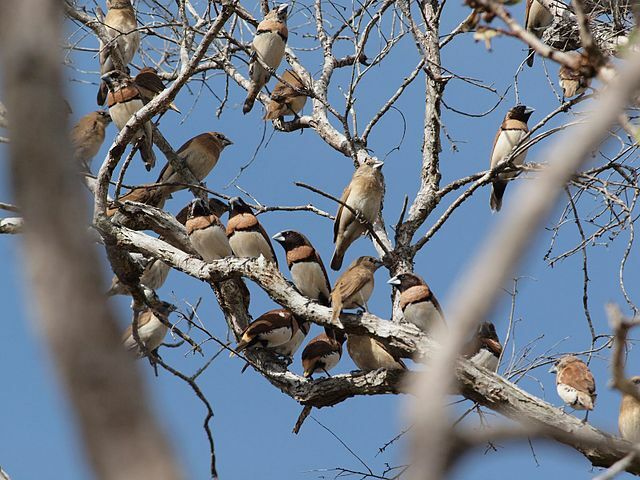 It is supposed to be quite abundant in the Ord River irrigation area near Kununurra. 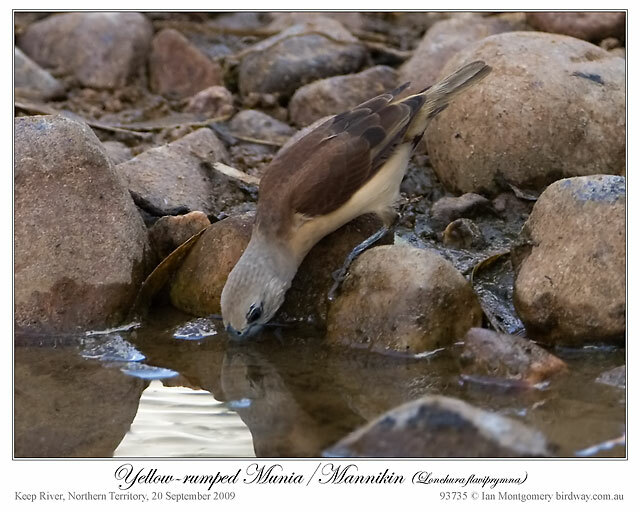 We searched quite diligently in many of its favourite locations without finding any and it wasn’t until, on the return journey, I saw this single bird in the company of Chestnut-breasted Munias/Mannikins at a water hole in the Keep River district on the Northern Territory side of the border. Compared with the almost meretricious plumage of the Gouldians and the exuberance of the bathing Chestnut-breasteds, ‘restrained elegance’ comes to mind in both the appearance and behaviour of the Yellow-rumped: tasteful but subtle colours and decidedly demure beside its frolicking companions. Even when drinking, as in the second photo, it sipped delicately from a high perch as if not wanting to spoil its costume. 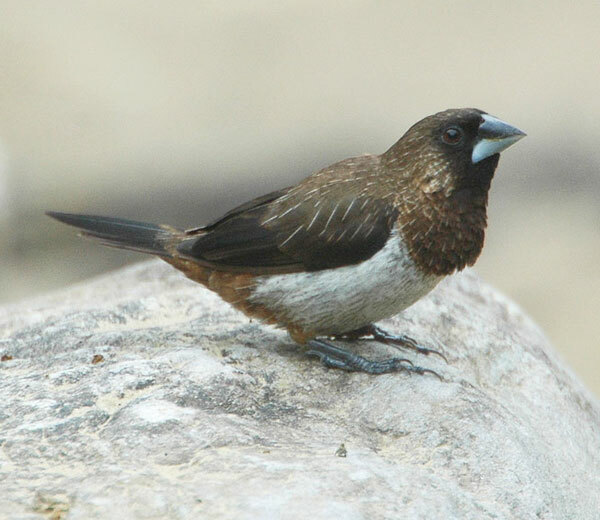 The Yellow-rumped is closely related to the more widespread Chestnut-breasted and, in addition to consorting together, they sometimes interbreed. I’m in Sydney briefly for last night’s presentation to Birding NSW. It was an enjoyable evening with a delightful group of people but I am returning home prematurely this afternoon. There were several bushfires burning near my house in unseasonably hot and dry weather and I don’t feel comfortable being away longer than necessary. I’ve posted a dozen photos of the Gouldian Finches at Wyndham to the website to join several that I took at Mornington Station in the Kimberley five years ago: http://www.birdway.com.au/estrildidae/gouldian_finch/index.htm . Checked out Ian’s Gouldian Finch photos and they are really neat. Two verses come to mind about these birds. While I was looking for extra photos of the birds, I found many of these birds have been kept as pets and also the diet of most of these is grain and seeds.